Video clip synopsis – Australian content on television reflects our culture and our society. Mac Gudgeon celebrates the importance of Homicide in the history of Australian television production. Stuart Cunningham and Scott Goodings remember some of the popular dramas which showed Australians that they could love Australian programming. Broadband MP4 drama_bb.mp4 (10.0MB), suitable for iPods and computer downloads. 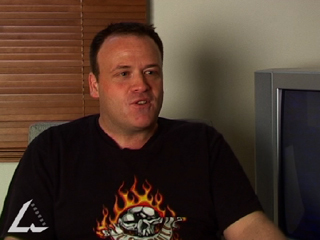 The interviews with Mac Gudgeon, Scott Goodings and Stuart Cunningham were recorded for the website From Wireless to Web, produced in 2005. In 1964 Melbourne’s HSV7 commissioned a weekly police drama called Homicide from the production house of Hector and Dorothy Crawford. Based on their earlier radio drama D24, the first episode titled ‘The Stunt’ screened at 7.30pm on Tuesday 20 October 1964. For the first time in a television drama, Australian audiences were confronted with culturally familiar settings and characters without American or English accents. Cops in Ford Falcons chased criminals around Melbourne backstreets, rather than American police in Chevrolets steaming down Sunset Strip. According to Australian Classic TV, Homicide is 'the most important and most popular drama series ever produced in Australia’. Homicide was a great success and ran on the Seven Network for close to 500 one-hour episodes over 13 years. (Day 143) The series achieved limited international sales – the first Australian television series ever to do so – and stimulated the production of other local television dramas in the 60s and 70s, particularly in the police crime genre: Cop Shop (Seven), Division 4 (Nine) and Matlock Police (Ten). Homicide demonstrated two significant factors to the Australian broadcast industry, relating to production at that time. Firstly, it showed that the local industry was capable of producing quality dramas, using the talents of a large pool of local actors, directors, writers and production crews. It further demonstrated that Australian audiences would watch, and actually preferred to watch, programs made by Australians for Australians. the resolution of the drama. In the broadcaster interview with Mac Gudgeon, he explains the significance of ‘home-grown’ drama in the development and evolution of the television industry. Look at current television drama and evaluate the difference between Australian and American productions. Do you have a particular favourite in terms of quality and engagement with the audience? Explain the significance of the student’s selection. Provide a historical account of ‘film noir’ and its influence on crime dramas such as Homicide. Ask them to explain why it was a good drama and what their memories were of the production and the structure of the drama. Ask them to make comparisons with a contemporary police drama of today, such as Blue Heelers.